Mechanical Soil Compactors - Gilson Co.
HM-530 Mechanical Soil Compactor automatically counts the number of hammer blows and shuts off when a preset number is reached. The Mechanical Soil Compactor brings big improvements in functional accuracy, ease of use, reliability, and safe operation to your laboratory. The HM-530 Compactor eliminates the strenuous and repetitive manual operation of compaction hammers. Hammer blows are accurately counted and evenly distributed for each soil lift placed in the compaction mold. Automatic indexing of the turntable positions the mold for each new hammer drop. The simple and efficient chain-drive lift system employs a compensating mechanism to adjust hammer drop for soil thickness in the mold during compaction. Hammer mass is concentrated near the bottom for better transfer of energy to the soil specimen. This unit is a safe and efficient method for processing moisture-density samples, assuring uniform compaction and accurate, repeatable test results. 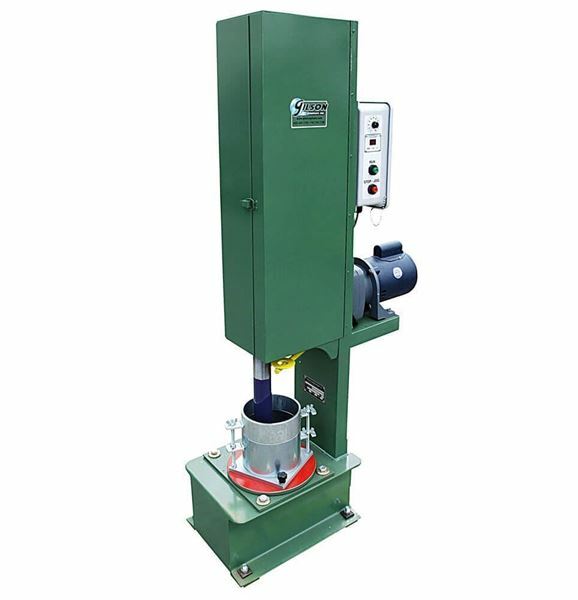 The Compactor can be used with HMA-110 & HMA-111 4in (102mm) ID Molds, 5.5lb (2.5kg) weight with 12in (305mm) drop. The HM-530 also accommodates HMA-116 & HMA-117 6in (152mm) ID Molds using either the standard 5.5lb (2.5kg) weight with 12in (305mm) drop or the modified 10lb (4.5kg) weight with 18in (457mm) drop. The standard 2in (51mm) hammer can be replaced by one of the same 3.14in² area, but with pie-shaped face to cover entire sample surface with 6in molds. The hammer lift compensates hammer drop for soil thickness in the mold during compaction. The free-fall hammer adjusts easily from 5.5—10lb by addition of a surcharge weight. The HM-530 includes a 2in (51mm) round, 5.5lb (2.5kg) hammer, a 10lb pie-faced hammer for use with 6in molds, and a surcharge weight to increase total hammer weight to 10lbs (4.5kg). 4in (102mm) and 6in (152mm) standard compaction molds, and a digital automatic counter with start/stop switching are also included. Electronic safety interlock automatically shuts down operation if the door is opened. 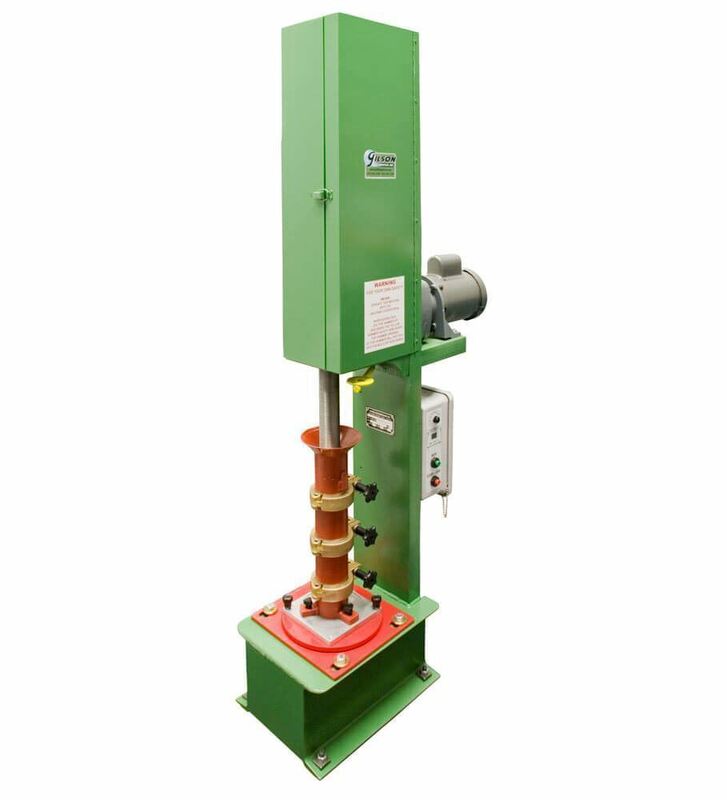 HM-531 Mechanical Soil Compactor for California Method 216 is similar to HM-530, but is supplied with 2in (51mm) round 10lb hammer only. Order special 16x2-7/8in (406x73.2mm), HxID Model HMA-119 Relative Soil Compaction Mold for California Method 216 separately. Required piston and rod are included as parts of the machine. HMA-120 Mechanical Soil Compactor Calibration Kit is ordered separately and required to fully comply with ASTM D2168 Method B requirements and includes lead deformation apparatus, a micrometer, and fifty lead cylinders. HMA-121 replacement Lead Calibration Cylinders are also available.